There was a stupid amount of pride that went into buying my first Red Brand Field Fence. The Pennsylvania-Based company had been publishing ads in homesteading and farming magazines long as I could remember reading them. I would read them while paging through Hobby Farm in college—wondering how anyone gets to a point in their life when they are deciding between woven and welded wire fences instead of foam or no-foam in their coffee. Now I was standing in the chain-link yard at Tractor Supply buying one. I watched the forklift ease the giant roll into the back of my pickup, swelling with quiet pride. As I pushed the monster into bed, I thanked the staff that helped me load it, and then slammed the tailgate shut. Slammed it the way I dreamed of slamming it for years before owning a truck. That satisfying "CligUNK". Now, I was going to build my sheep a proper fence. I wasn't sure how though? The old fence was barely keeping it together and that took me a whole day. This heavy-duty job would require more help, proper tools, and I bought it just hoping it would all work out. Some times things do. At least if the right people show up...Three blog readers heeded the call for help. Jeff, Kathy, and Marie all gave up a beautiful Saturday evening to come here and work up a sweat. Thanks to their time, gloves, toolboxes, and good intentions we had the whole operation done in under three hours. Quite the accomplishment. Kathy and Marie arrived first. They pulled into the driveway in a Prius wearing workbooks. (These were my kind of women.) We shook hands and said hello and I invited them inside. I was in the middle of baking an apple cake (which almost felt contrived) but I had been invited to a neighbor's house for dinner and was scrambling to make something to bring. My mother raised me to never show up as a dinner guest without a covered dish or bottle of wine. As I poured the batter into the bowls we chatted about their farm (WindWoman Farm, outside Albany) and about their own hope for dairy goats soon. They wanted Nigerians, and I was already excited for their future kids. Jeff pulled up in his truck shortly after. He walked out to meet us in the field with bolt cutters in one hand and work gloves in the other. All four of us were ready to get to work. 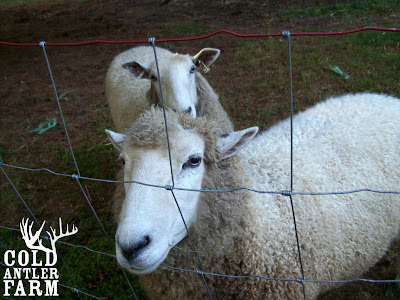 We moved Sal and Maude to electric netting in a separate area so we didn't have to worry about sheep running around us and started ripping down the old fence. In no time we were measuring t-posts and pounding in new ones. I did a lot of running around, helping really, these folks were experts. I tried to be of use but while they cut the wires and pulled the fences tighter I spent most of my time in awe of their efforts. I'd grab them a cold cider if they needed it, or would grab a hammer from the truck. Not that I sat and watched, I was in the thick of it too, but I have no idea how I could have done it without them. I am beyond grateful for their assistance. I made sure they knew I was there to help with any moving days or ditch digging in their futures. And since Kathy is taking a timber frame building course in Texas soon, who knows, there might be a barn raising in our future. When the fence was up and our work finished, we retired to the porch for apple cake and cold beers. We sat in a row, our feet dangling over the porch while we chatted and ate. The geese joined us and waddled around our feet, judging us in their goose way. When the beer and cake was downed, the three heros watched as I let Maude and Sal back into their new pen. A small cheer went up, if not from the onlookers - perhaps in my own head. Closing that gate was a call for emotional applause. We did it and now the sheep had a good strong fence for winter. I had little to offer them as thanks, but made sure each of them left with a pound of pumpkin coffee and a hug. A fine days work, that. all i can say is i wish i had had some helping hands that know what they were doing. life is so much easier with them. thank the gods for the people who would give up a saturday to help out! I love stories about community. Good stuff! That's what being neighbors is all about...even if they may live a hundred miles away. Do Marie and Kathy have a blog? I would love to learn more about their building adventures. Kathy, Marie & Jeff, thanks for looking out for Jenna! Nothing like friends new and old to get the job done. I had a small 4-loose-cows-that-I-was-babysitting episode last night and people I didn't even know came to help me get them back in their paddock. It's really great to part of a community of people that will drop what they are doing and come to someone else's help. Someday, I hope to pay it forward. Jenna - I'm wondering if Kathy's timber framing class is at the place near me (Homestead Heritage, near Waco). If so, she's welcome at our place for dinner. We're about an hour north of there, but we're on the way to/from the airport, if she's flying into Dallas. My husband has taken that timber framing workshop, and really enjoyed it. Anyway, I don't know if she knows anyone down here or not, but if she needs help with anything while she's here, or just a friendly face, our door is open. Congratulations!!!! I remember stringing fence, miles of it, with my grandpa. I must say as a kid, I didn't know what a treat it was. It does make a very fond memory. And, when we finally "get outta town", I'll know how to put up a fence. I love your writing, and am praying that your forever farm finds you soon. thinking something appley would taste pretty good right now, but I was wondering..there was a blog before COLD ANTLER, right? Is that still available to read? So happy you found some folks to help out with the winter paddock. Fencing definitely isn't a one-person job, even if they know what they're doing! Sal certainly looks pleased with the job. Well done, you four! There was a blog before cold antler, called dogcoffin. It was about life in tennessee/idaho before the farm became my life's goal. Since it was mostly personal stuff, it went private when the book went out. I never update it anymore, but sometimes i post old entries from it. and photos. It is always good to hear about people chipping in when necessary. It seems someone has always been there to help John and me when we've needed it and we try to pay it forward when possible. I had a great day working in the yard/garden and it feels terrific when you are done. I know there is intense pride and the feeling of accomplishment when you look out over the physical evidence of all the work. My only regret about this weekend is that I live too far away to have helped. But maybe one day I'll be up that way or you down this way and we will be able to meet and share a bit. What a wonderful gift. You are blessed in many ways. It is always nice to hear of folks helping each other. The Amish people have always done this, to bad most of society has forgotten it. It's amazing what a person alone can accomplish when necessary, but fencing? Especially with that kind of big roll of heavy wire? I won't say it would be impossible, but . . . you were lucky to have three others to help you. There is nothing so satisfying as having good fencing to keep sheep in, though. Worth every penny.